I absolutely adore shopping at Sam’s Club. It hasn’t always been this way. Back when I first started trying to cut my household budget, I didn’t think I would benefit from a warehouse store membership. Then I caved and took advantage of a membership promotion and the rest is history. I’ve been shopping there consistently ever since. Here are my top 11 reasons to shop at Sam’s Club. Low membership fees. The Sam’s Saving’s $45 membership is the lowest among warehouse store membership fees. Other warehouse store memberships come in at $50 and higher. Amazing membership promotions. With this coupon, you can get a $20 gift card when you sign up for membership, making it an even better value. Online ordering. It’s easy to shop at Sam’s Club without leaving the your home. Grab a cup of coffee and kick back while you order via your computer or the Sam’s Club app. And with easy online reordering, you can have products you use regularly shipped quickly and easily to your home. Free store pickup. Or if you’re like me, and like to avoid shipping fees, then opt to have your items shipped to store for pickup. You can even order grocery items like fresh produce and meat, or household cleaning products for pick up. Self-checkout. Sam’s Club also offers the convenience of self-checkout if you’re shopping in-store. Scan and Go app. This is probably one of my favorite reasons to shop at Sam’s Club. You can download the Scan and Go app which allows you to scan your items as you add them to your cart and then conveniently pay on the app as well. Then you just proceed to the exit, show the greeter your online receipt and off you go! Instant Savings. You can save even more by taking advantage of instant savings offers on tons of products throughout the store. The offers change monthly and are automatically added to your card when you purchase a participating item. Fabulous fashion finds. Sam’s Club offers trendy fashion from name brands at a fraction of the price you’ll pay at the mall or a specific retailer. Their every day prices are awesome, but I also love shopping their “Last Ones” sales. I’ve picked up cardigans from The Limited for less than $10 and Eddie Bauer tops for less than $8. Just recently, I scored a chambray shirt dress for $9.99 and last summer I bought a super cute maxi dress for less than $10. Great prices on meat. Sam’s Club has really great prices on meat. For instance, I pay $2.98 for 90% lean ground beef and $1.99/lb for boneless, skinless chicken breast. But that’s not all, I find awesome savings on baby back ribs, whole chicken, steak, fish and more. Yes, you’ll have to buy bulk packages, but that’s what your freezer is for! Fresh produce. Sam’s Club features some of the best produce I’ve seen. Sometimes you’ll pay a bit more, but sometimes you’ll pay a bit less. And it’s FRESH. For example, I love picking up Taylor Farms ORGANIC spring mix for less than $5 for a 16 oz tub (compare to $5.98 for a 10 oz tub at other grocery stores). I also find the best strawberries, blueberries, blackberries and blueberries. They’re always sweet and ripe. Huge savings on household products. I always take a trip down the household cleaning and laundry detergent aisle. Many times you can find great prices and if you’re lucky, instant savings! I regularly find the best prices on OxiClean (I just bought a 10.1 lb tub for $12.48 after $3.50 instant savings – compare to a 3 lb tub for $6.98 at other grocery stores). I also found 105-ct. Finish Dishwasher Detergent Tabs for $11.47 (my buy price at 11¢ per tab). Even more savings throughout the store! The reasons above are just a drop in the bucket compared to all the other ways you can save throughout the club. You’ll find great offers on office supplies, kitchen and housewares, patio and garden, healthy and beauty and so much more. Just for fun, I thought I’d give you a peak at my shopping cart this week…. Are you convinced yet? Don’t forget to use this coupon when you join. You’ll get a $20 Sam’s Club gift card which is like paying just $25 for your membership! I guarantee you’ll save way more than that your first year! Oh, and you can also enter to win a Sam’s Club Membership! 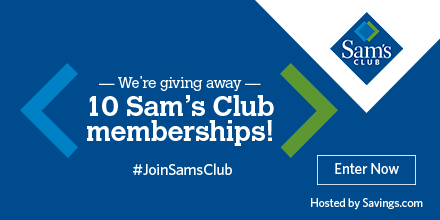 Head on over to the Sam’s Club merchant page on Savings.com and enter to win one of 10 Sam’s Club Sam’s Plus memberships! Entries for the giveaway are open through Friday, June 2nd at 11:59 PM ET. If you win, you’ll be notified by email on Monday, June 5th.